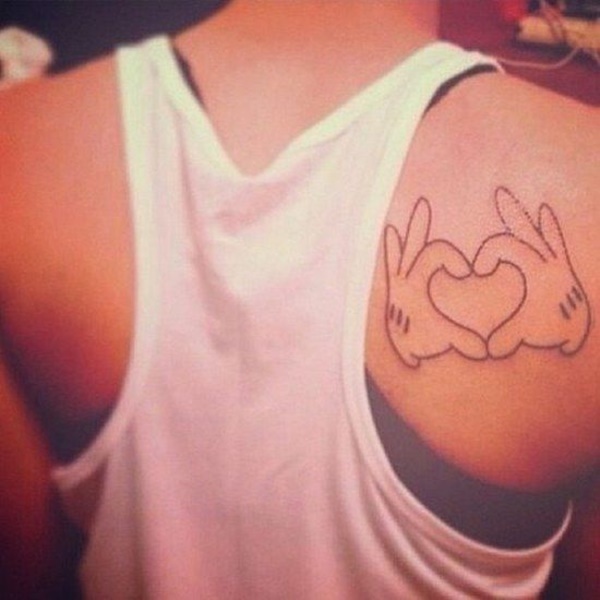 This article will assess 100 photos of tattoos meant to express the joy, pain, or strength of love. 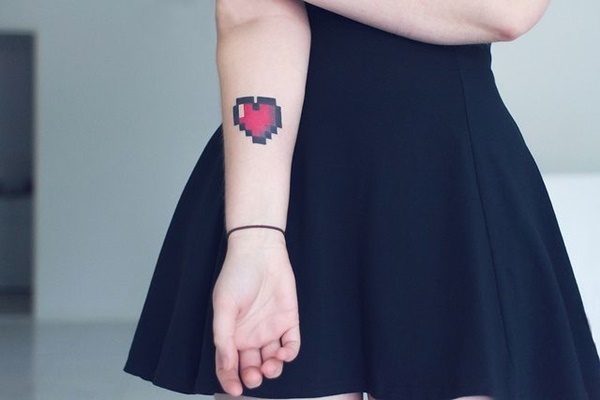 From hearts to quotes, a wide array of love tattoos are critiqued to help you identify the best concepts and methods of execution for your next tattoo. Whether you love or hate the photos and descriptions we’ve compiled, leave your opinions in the comments section! 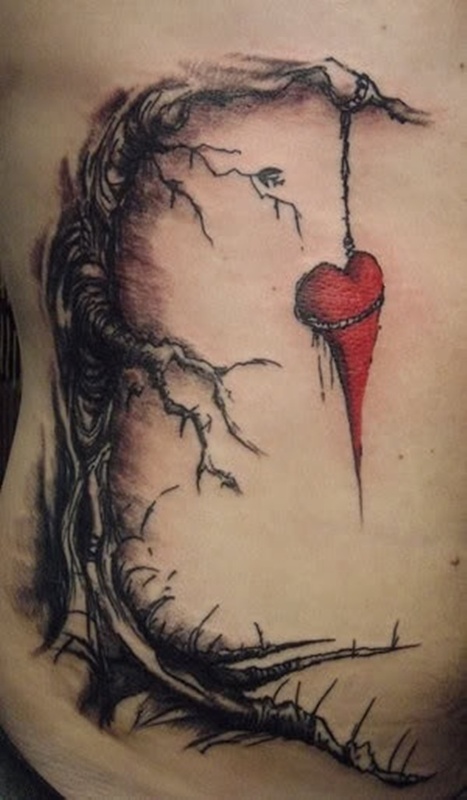 A broken heart exposes a rib cage, the concept seems a bit odd to me, but it is good work overall. The brown hue of the ink tells me this is a henna (temporary) tattoo. 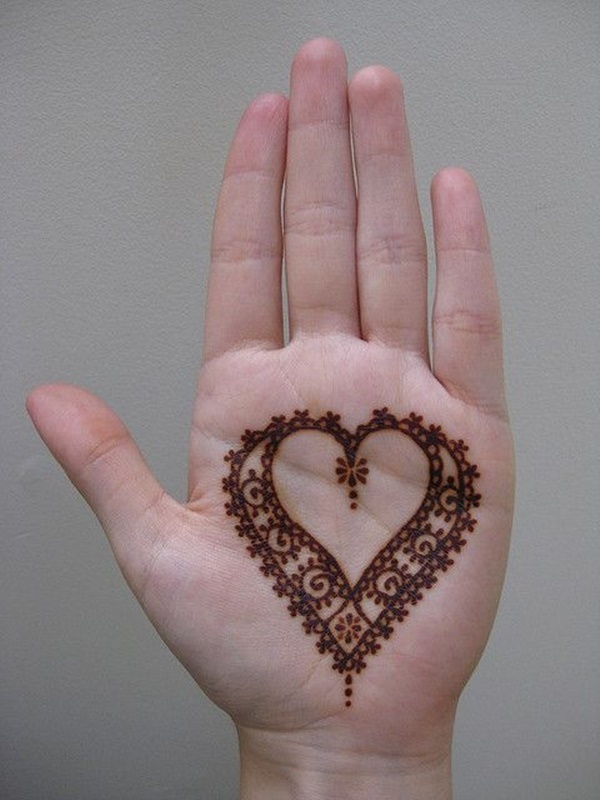 The design is a stylized heart with scroll embellishments on the wearer’s hand. Many tattoo artists will refuse to tattoo palms because the constant use of the wearer’s hand will diminish the work. 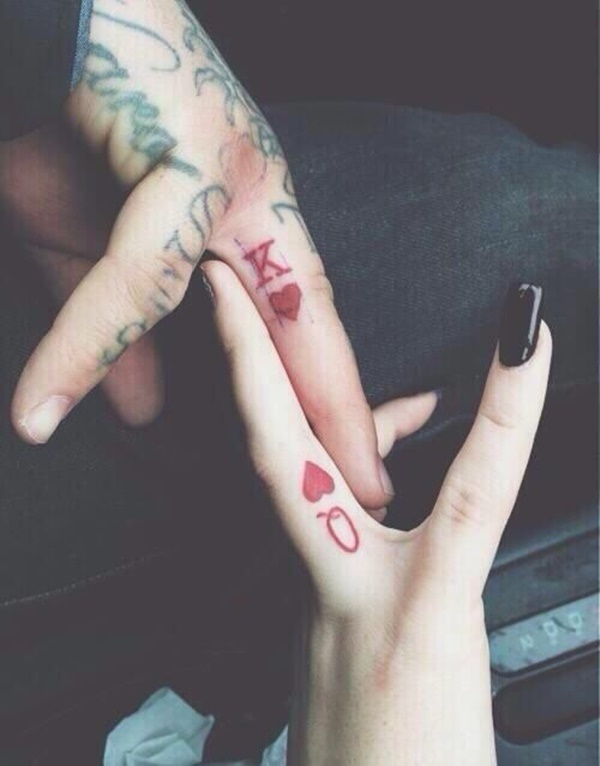 The outline of a blue heart is depicted on the wearers’ ring fingers in this tattoo set. 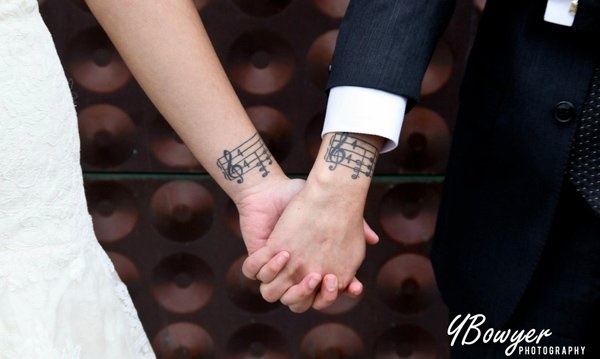 Sheet music complete with musical staff and notes is portrayed in black ink on the wearers’ wrists. The quote, “You are beautiful. you are valuable. 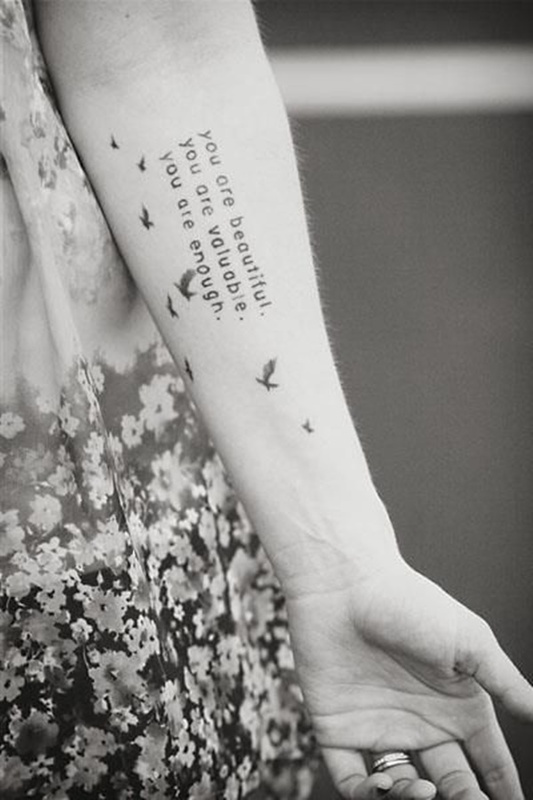 you are enough.” Is written in black ink along the wearer’s forearm and surrounded by the silhouettes of flying birds. 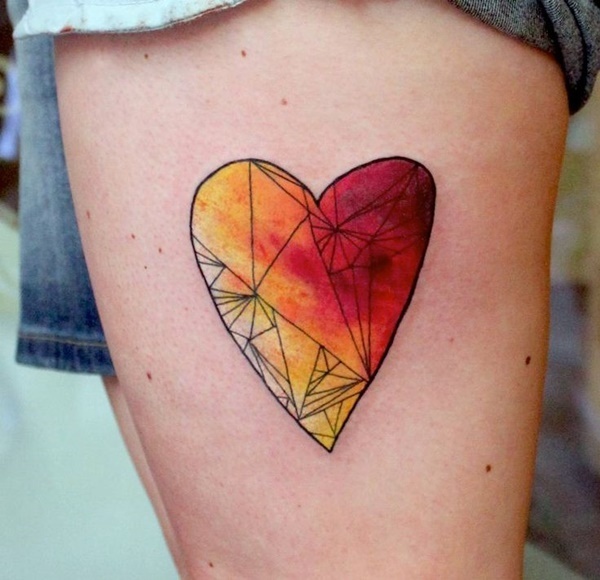 This abstract piece puts a twist on the traditional portrayal of a heart. 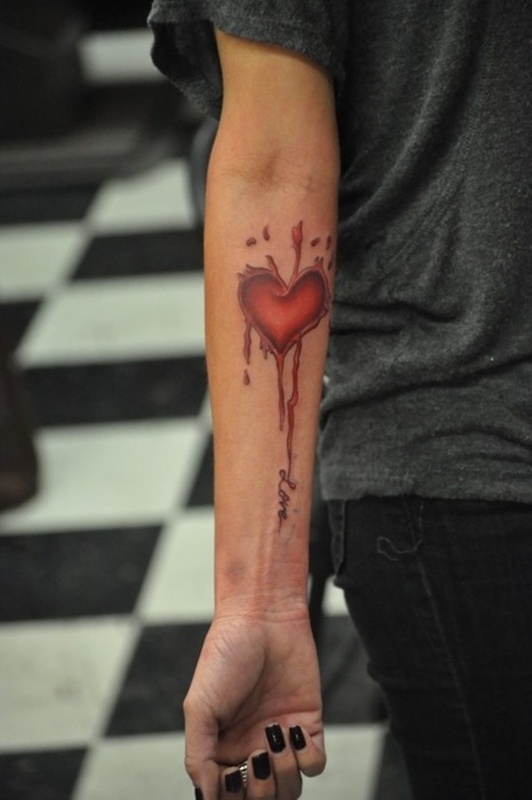 Ink blots are used to create the outline of the heart while smears of vivid pinks and purple color the tattoo. 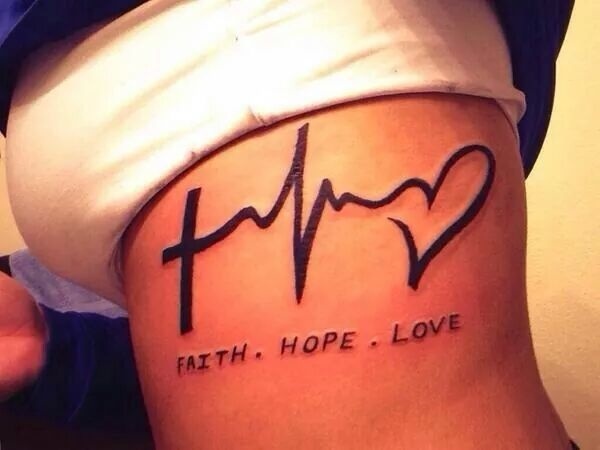 The words “Faith.”, “Hope.”, and “Love” are written underneath a cross, heartbeat line, and a heart outline. The entire piece is created using bold blacks on the wearer’s rib cage. 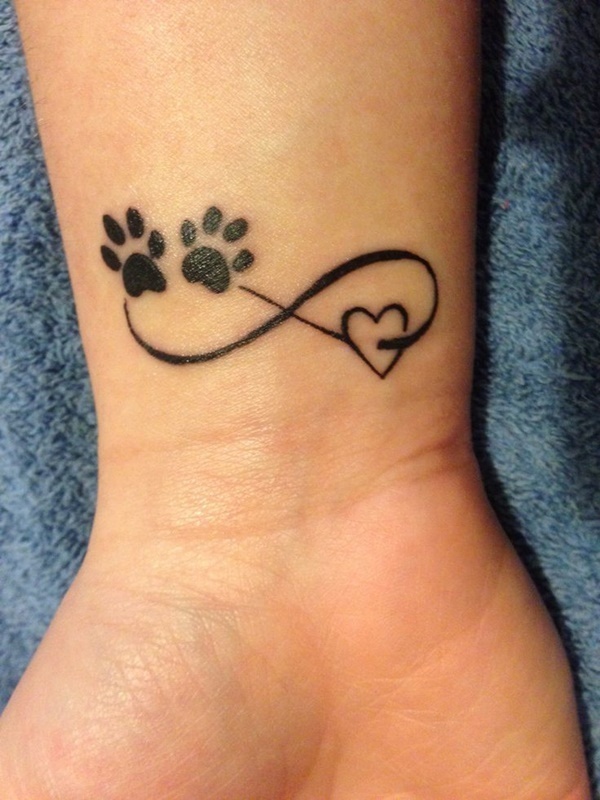 Some people really love animals, so much so that they feel the compulsion to permanently express that love through body art, for instance this wearer decided to express their love for animals by weaving an infinity sign through a heart and pair of dog paws. A full color tattoo depicts a sword piercing through a winged heart on the wearer’s chest. 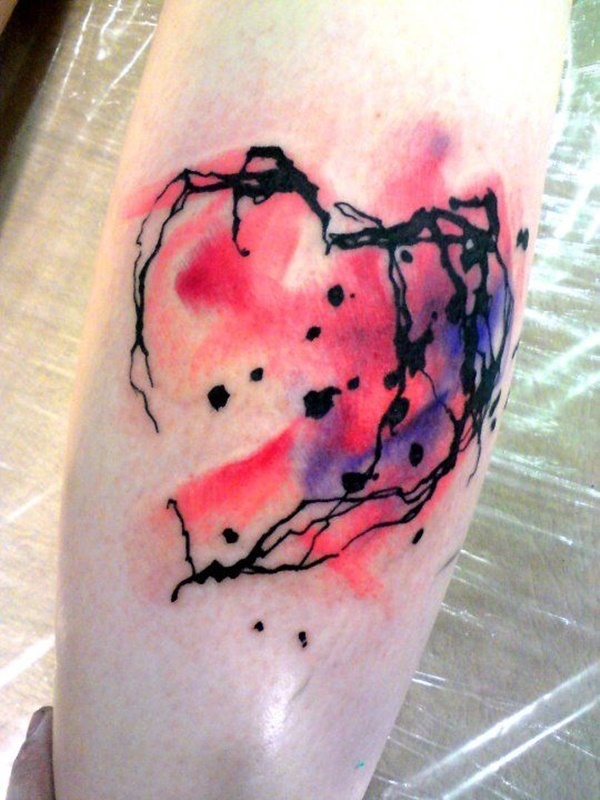 Countless black heart outlines overlap one another to create a surreal tattoo on the wearer’s bicep in this tattoo. 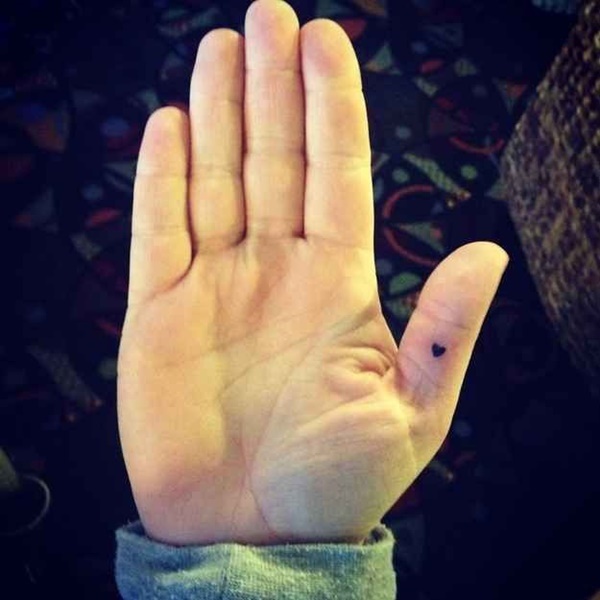 A very small, completely blacked out heart is pictured between the first and second knuckles of the thumb on the wearer’s left hand. 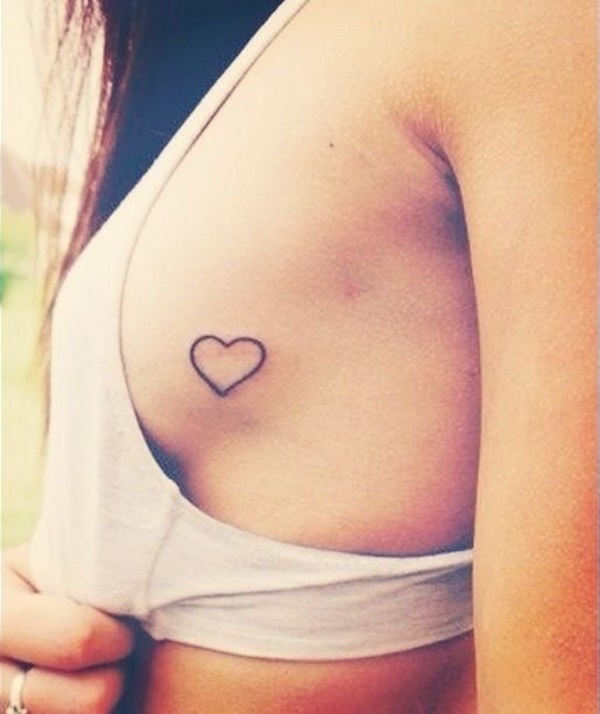 A black heart outline is seen on the outside of the wearer’s left breast. An example of a simple concept with simple execution being enlivened by creative placement. 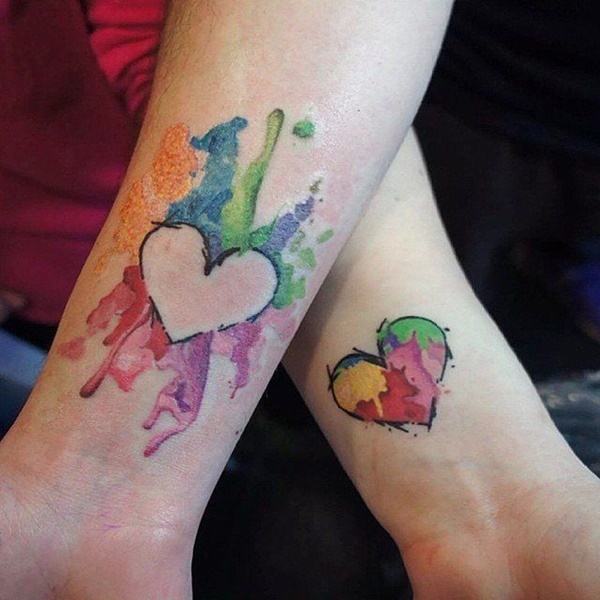 A tattoo set depicts black heart outlines imitating a pencil sketch filled with vivid imitation water colors with one heart containing the colors and the other being surrounded by colors. 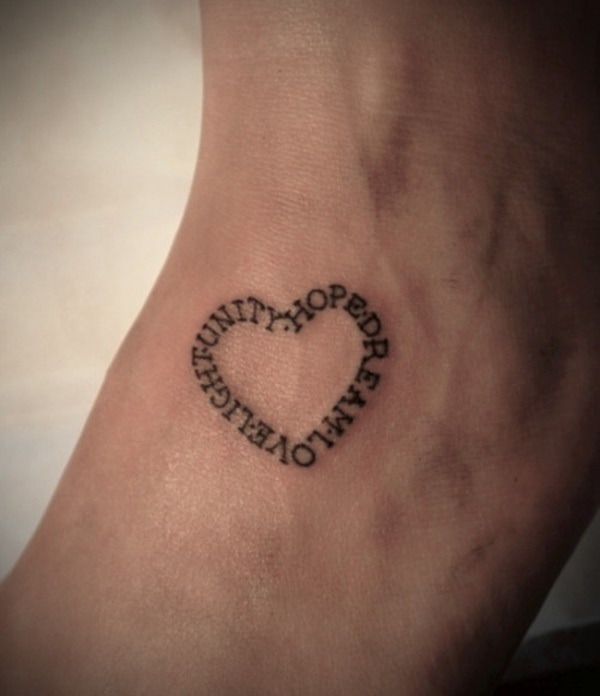 A crudely drawn set of people hold a crudely drawn heart between them and the childlike piece is located on the back of the wearer’s right ankle. A heart shaped lock is embellished with ornate designs reminiscent of Victorian antiques. The lock shows a hole for a skeleton key and is superimposed over a strip of cheetah print. The piece is depicted in a subdued color palette of black, red, and gold. These pieces are an homage to the classic video game franchise The Legend of Zelda. 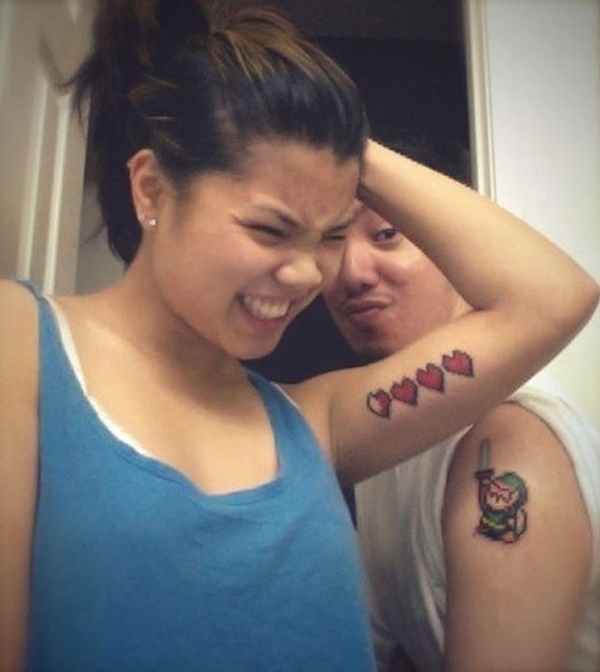 The four hearts pictured on the female’s bicep represent the life bar seen in the game while the male has the sprite for the main character “Link” tattooed on his bicep. Bad Hearts…or the Worst Hearts? 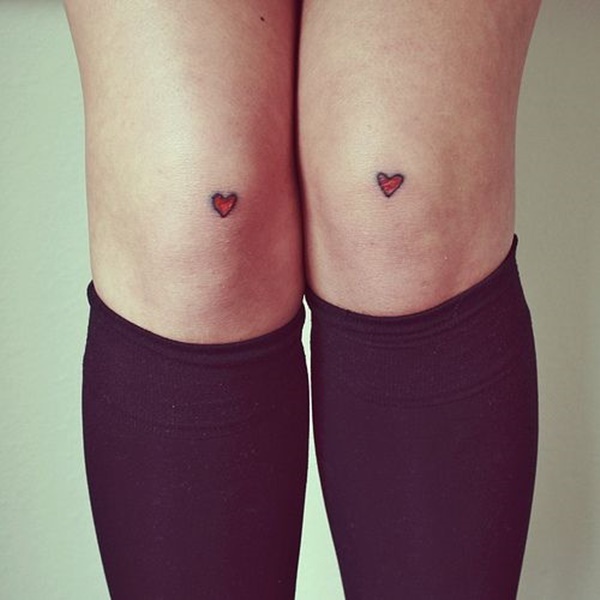 Tattooing knees is not an easy task and these deplorable example of hearts are evidence of that fact. 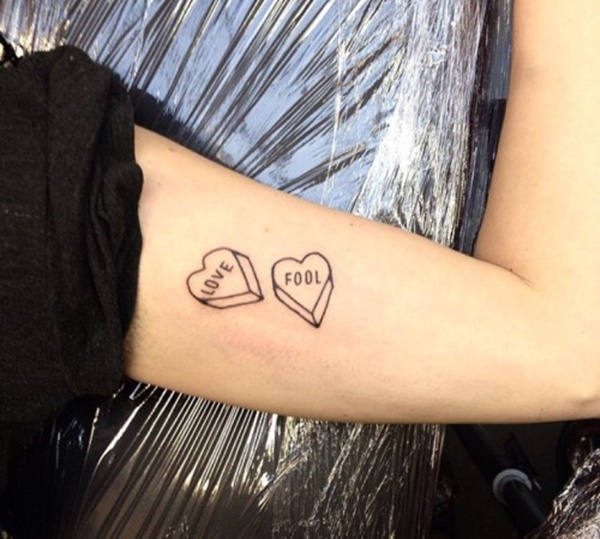 One of the tattoos is obviously higher than the other while the outlines are sloppy and misshapen and the color is poorly distributed. 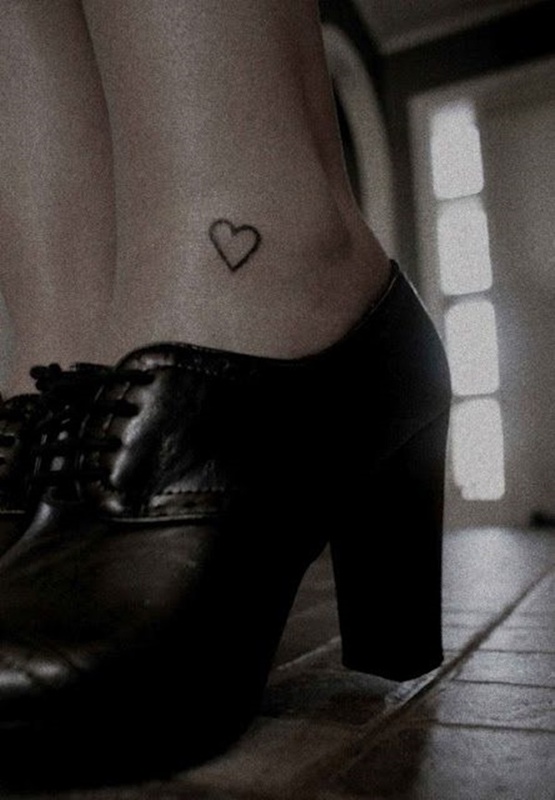 A blacked out heart is depicted on the wearer’s heel in this tattoo that is most likely rarely seen. Many tattoo artists will refuse to tattoo the bottom of the foot because the constant motion of walking will wear the work away. 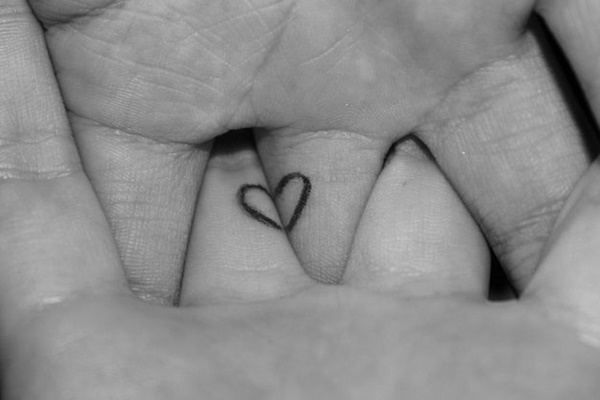 The wearers each have a half a heart tattooed on their ring fingers so when their fingers are interlocked they create a whole heart. Arguably the most recognizable pair of mouse gloves in the world form the shape of a heart with the fingers on the wearer’s right shoulder blade. 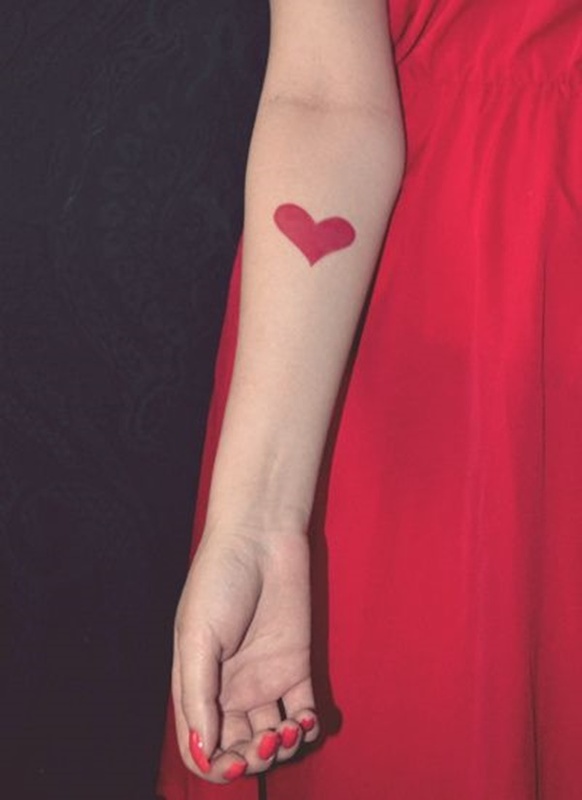 A completely red heart is depicted on the wearer’s forearm, the heart looks a little wider than a normal heart symbol and the sides are a little uneven. A life bar from the game franchise Legend of Zelda is followed by an extra life mushroom from the famous Mario game series. The images are represented in full color on the wearer’s wrist. 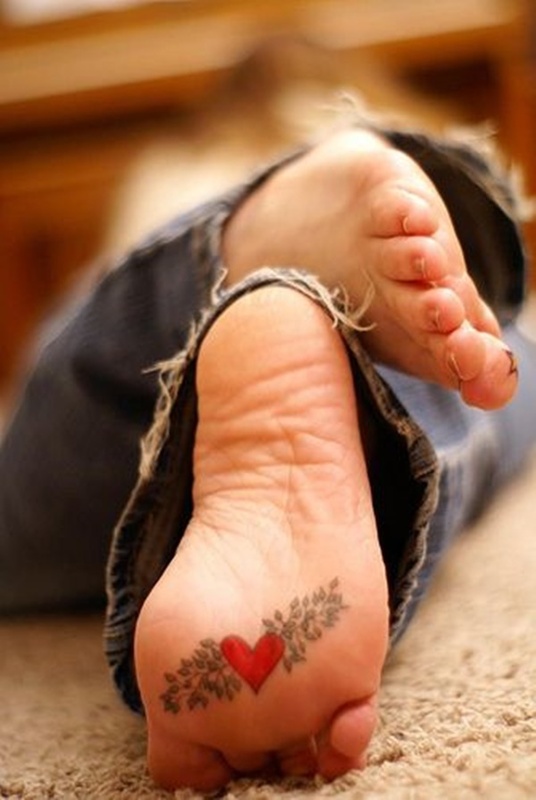 Another example of a heart tattoo on the bottom of a wearer’s foot, this time the heart is red with a black outline and accented by leaves on the left and right side. 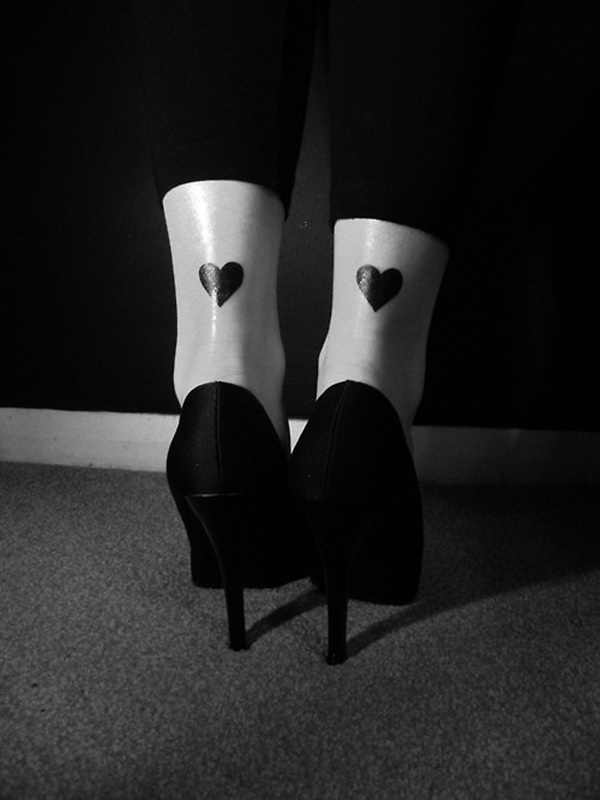 A blacked out pair of hearts adorn the wearer’s Achilles tendons in this tattoo set. 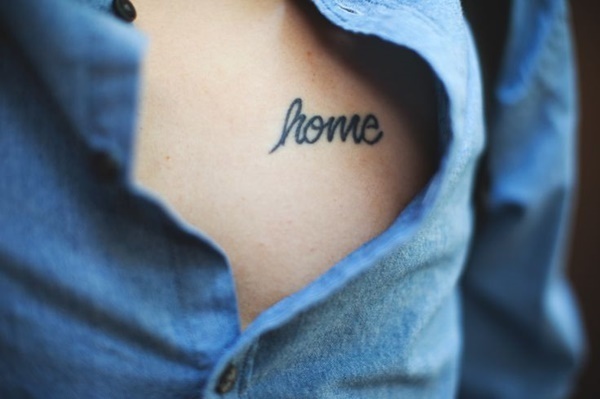 “home,” is spelled out in cursive font on the left side of the wearer’s chest over their heart. A knurled black and gray tree has a noose hanging from an outstretched limb that is wrapped around an intensely red heart. 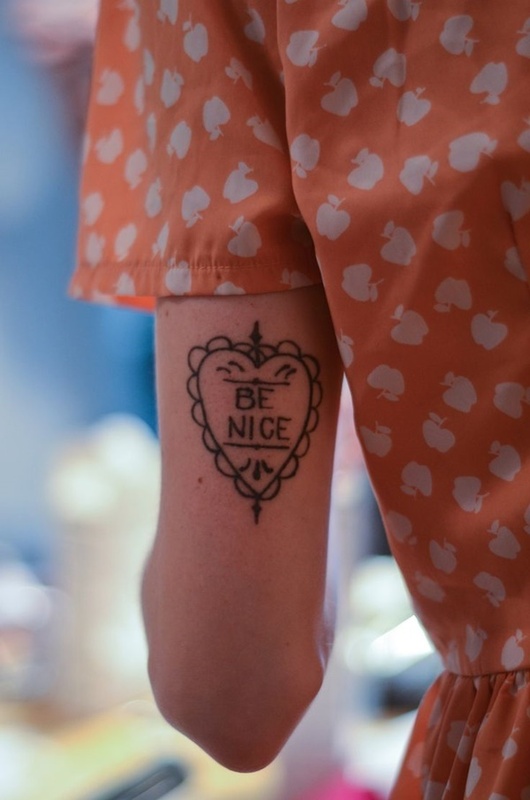 The phrase “Be Nice,” is written inside of a sloppily inked heart that is embellished with a border and dashes, the piece is pictured on the back of the wearer’s arm over their tricep. 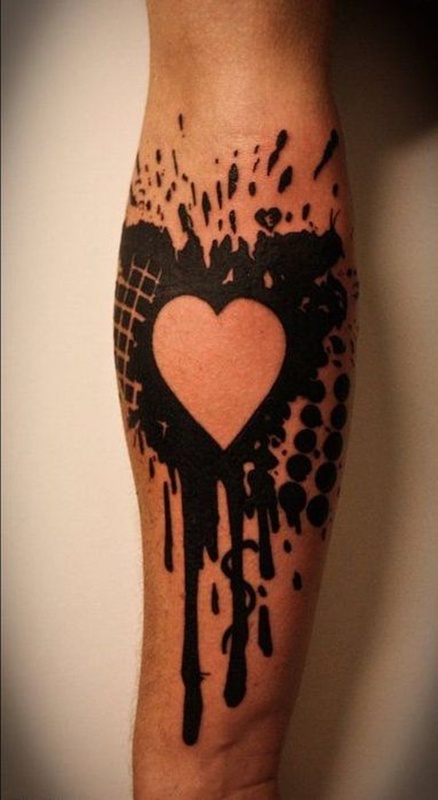 An ink blot utilizes negative space to depict a heart that is accompanied by a crosshatch pattern and a series of dots. 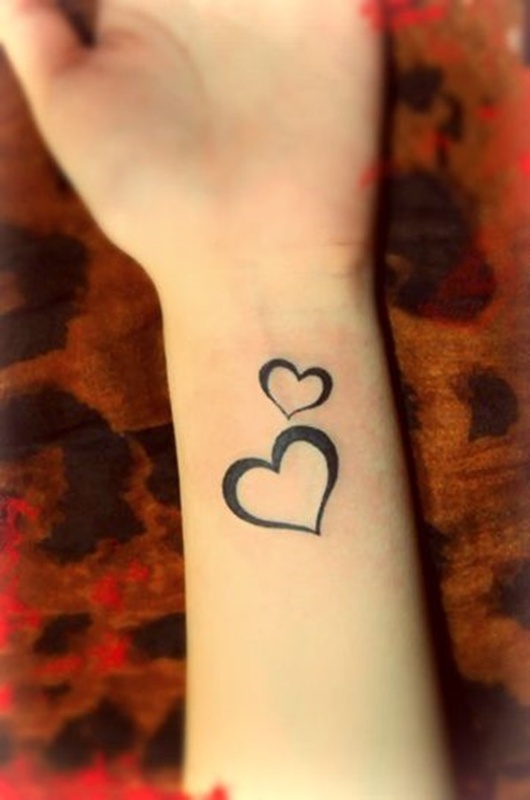 Another example of an ink blot utilizing negative space to portray a heart. Symmetrical, good color distribution, this pair of hearts adorns the wearer’s wrist and uses a bolder line near the top of the hearts to embolden the images. 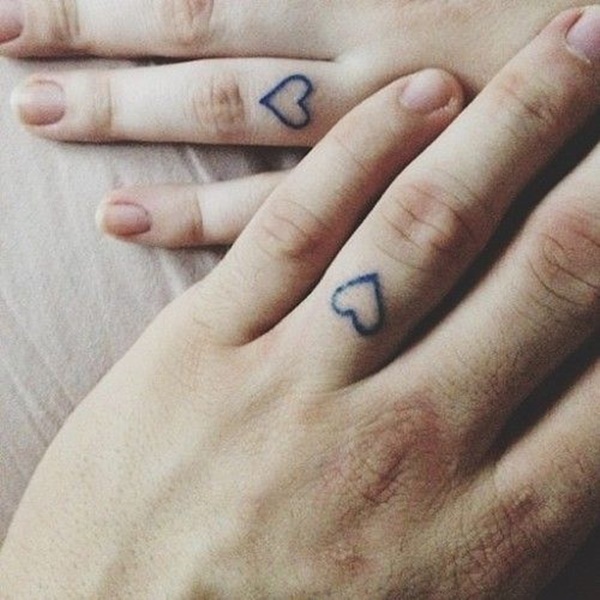 Heart outlines are depicted on the wearers’ ring fingers in blue ink in this matching tattoo set. 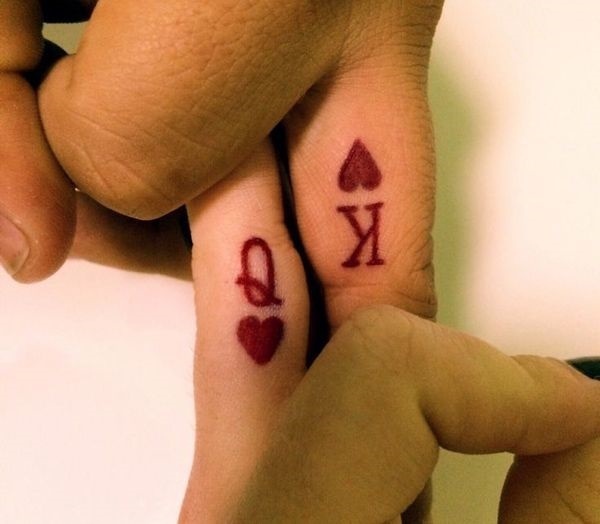 Another example of the king and queen of hearts symbols being tattooed on the wearers’ fingers, however, this couple has tattooed the images onto their ring fingers. 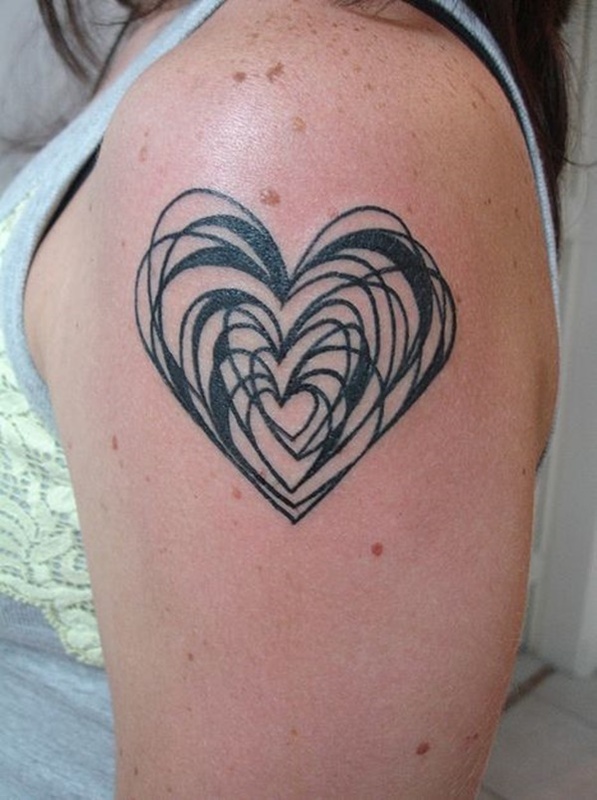 A pair of overlapping hearts are embellished with scrolls and created using black ink near the wearer’s right hip bone. Another example of blacked out hearts portrayed on the back of the wearer’s heels. A black heart outline is depicted next to a set of parentheses containing a heart colored red. This inventive piece adds a sense of complexity to the classic heart shape by fragmenting the piece with geometric shapes and coloring the piece with a vivid imitation of watercolors. 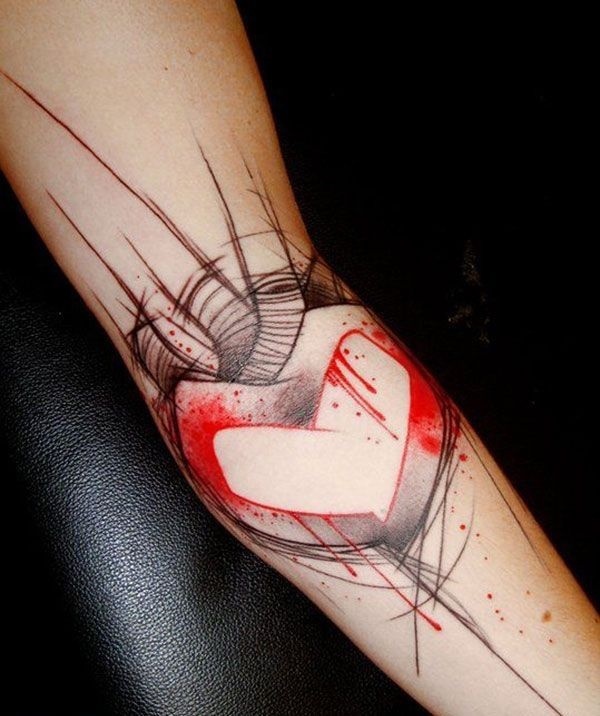 A stylized depiction of a heart is created using black and gray colors and accented red ink and aortas. 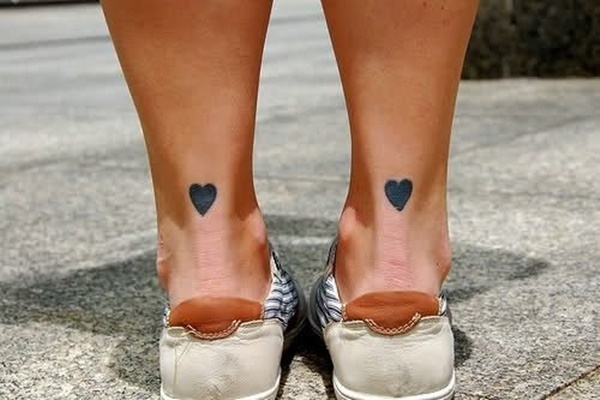 A black heart outline is pictured near the wearer’s left ankle bone. 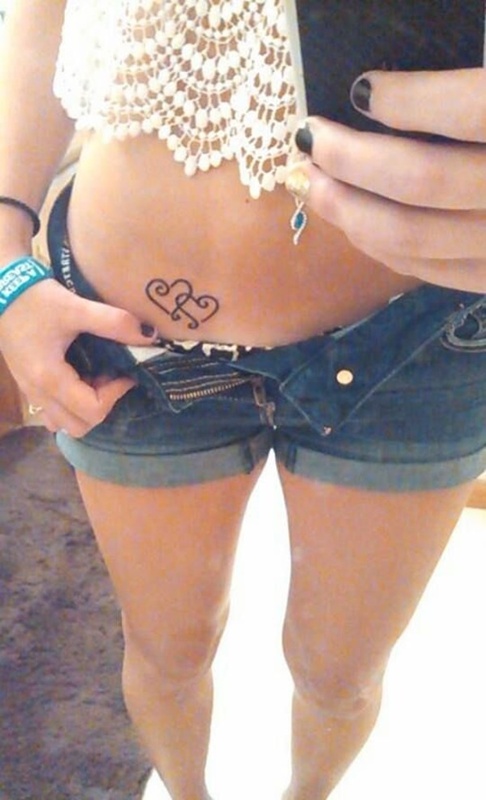 The piece is fairly simple, however, the heart is noticeably lopsided as the left side sits higher than the right. 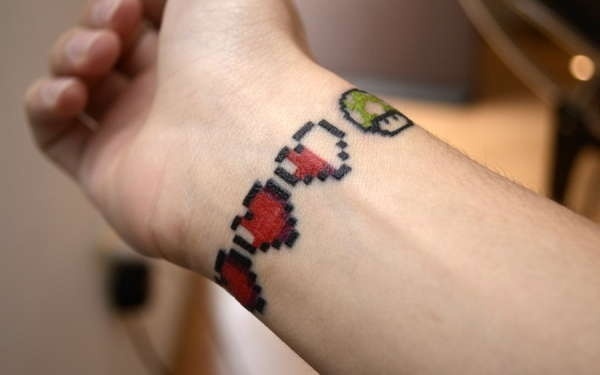 A pixelated heart used to represent the life bar in Legend of Zelda is inked on the wearer’s forearm. 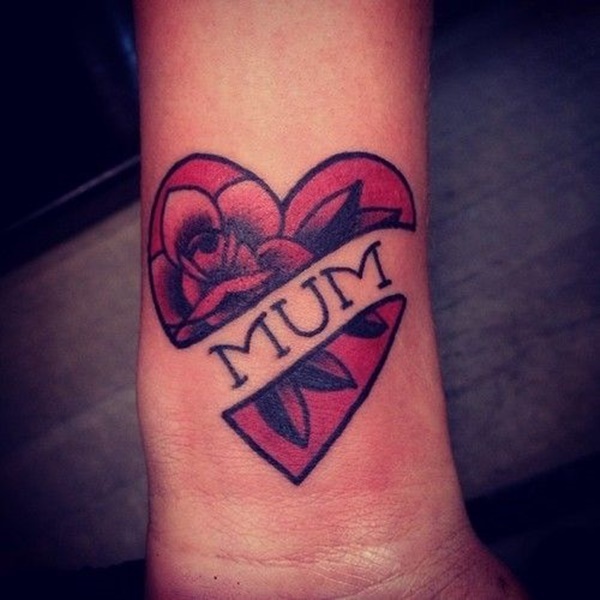 A heart containing a rose is depicted on the wearer’s wrist with a banner reading “Mum,” overlaid atop the heart. 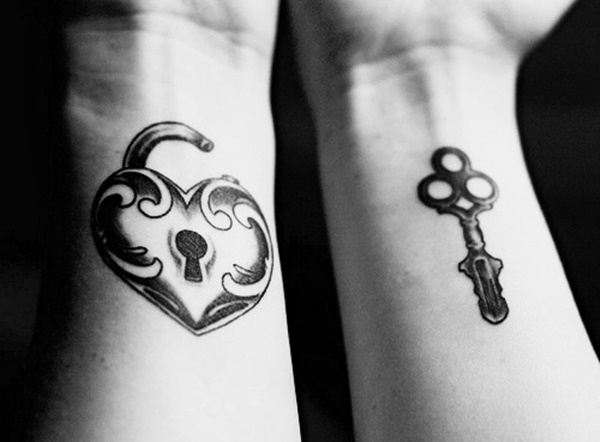 An incredibly well shaded key and locket are depicted on the wearers’ forearms. The key is topped with a heart shape while the locket is heart shaped and adorned with scroll work. 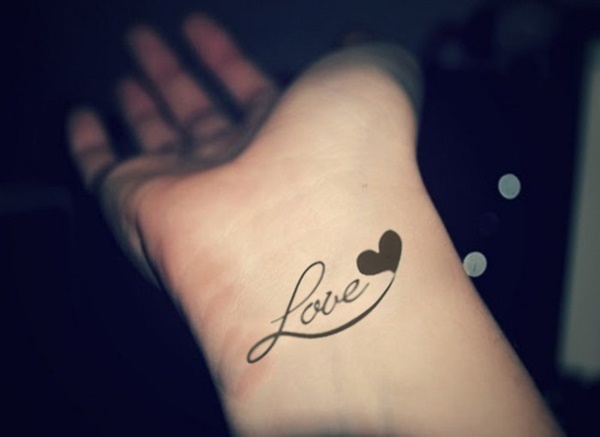 The word “love,” is scrawled across the wearer’s wrist in cursive font and black ink. 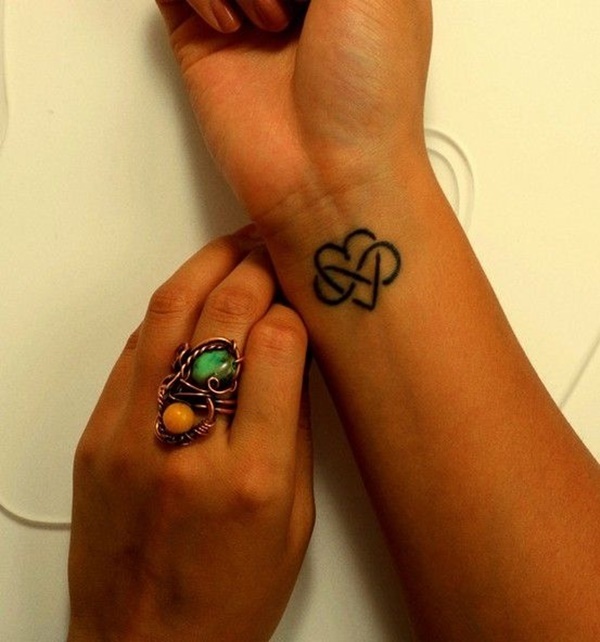 Black ink is used to portray an interwoven heart and infinity sign in this wrist tattoo. Apparently, nothing says love like a handshake. 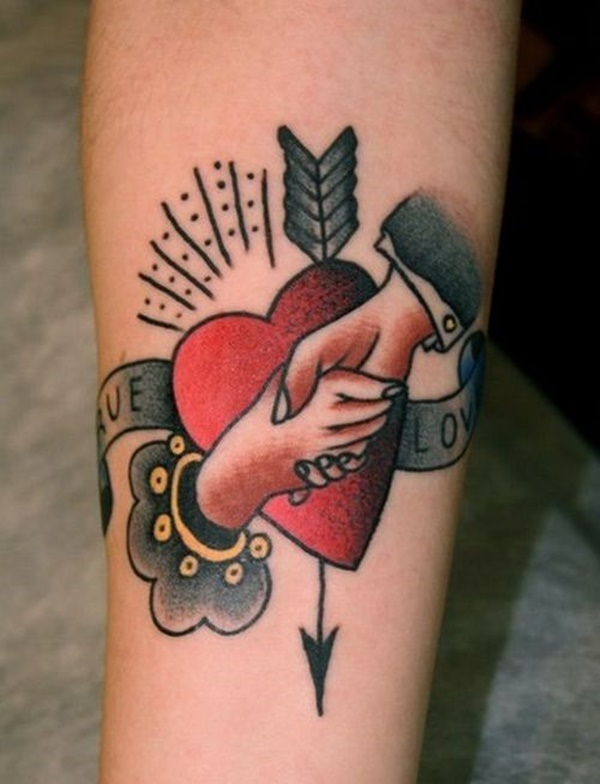 In this tattoo a heart pierced with an arrow sits behind a pair of shaking hands and a banner reading “True Love,” runs through the background. I will commend whoever did this because it is an efficient way to preview a tattoo, however, I will also condemn them for not having the courage to get a real tattoo. 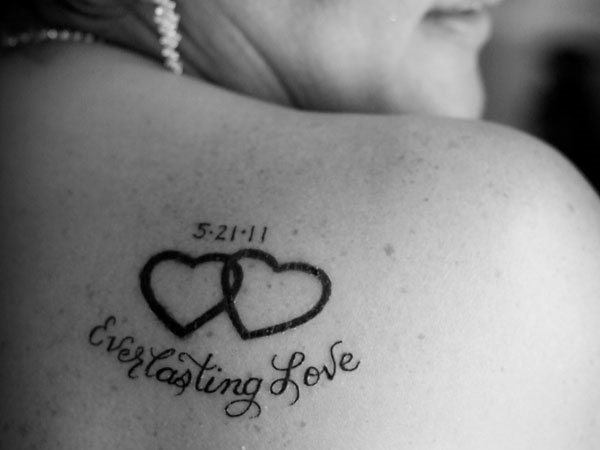 The wearer’s right shoulder blade sports a tattoo commemorating their anniversary with the date, two overlapping hearts, and the quote “Everlasting Love,” written in script font. This tattoo is reminiscent of the style of graffiti created by kids walking around with over-sized markers in their pocket, and I dig the piece. 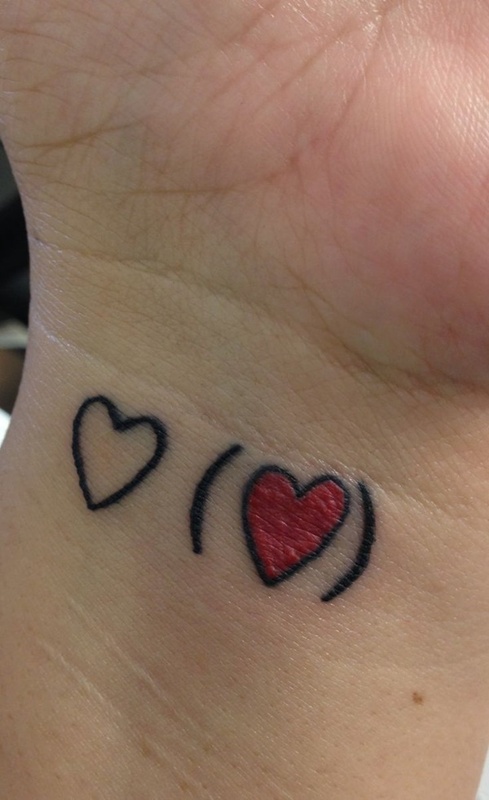 The quote reads “I Love You,” and replaces the O in love with a red heart. 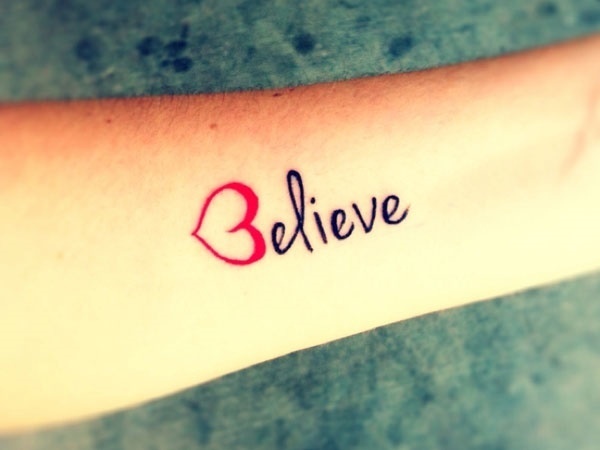 “Believe,” is spelled out on the wearer’s arm and replaces the capital B with a sideways heart. A stylized, red heart is pictured behind the wearer’s ear and is embellished with a set of horns, a devil tail, and a series of black dots. Underneath the heart the word “Love,” is written in an elaborate script font. 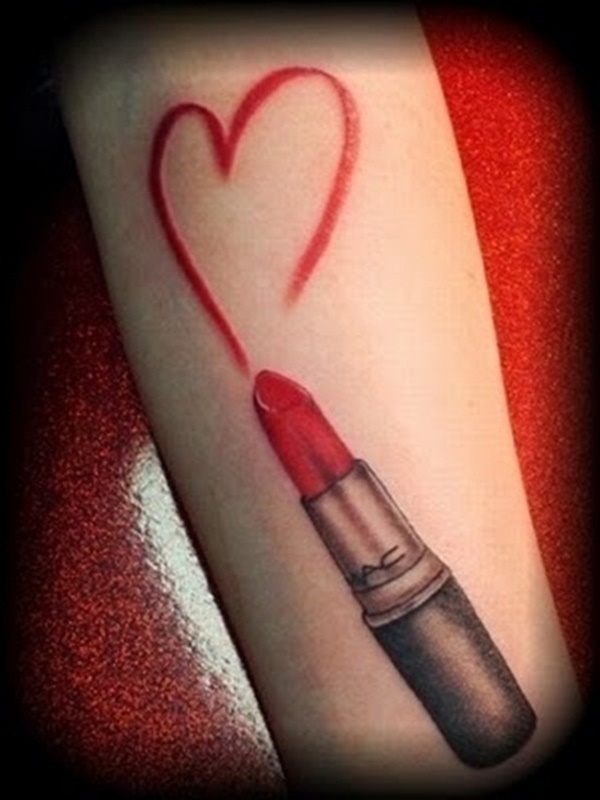 A red heart is drawn with a tube of MAC lipstick in this piece that professes love and consumer loyalty. 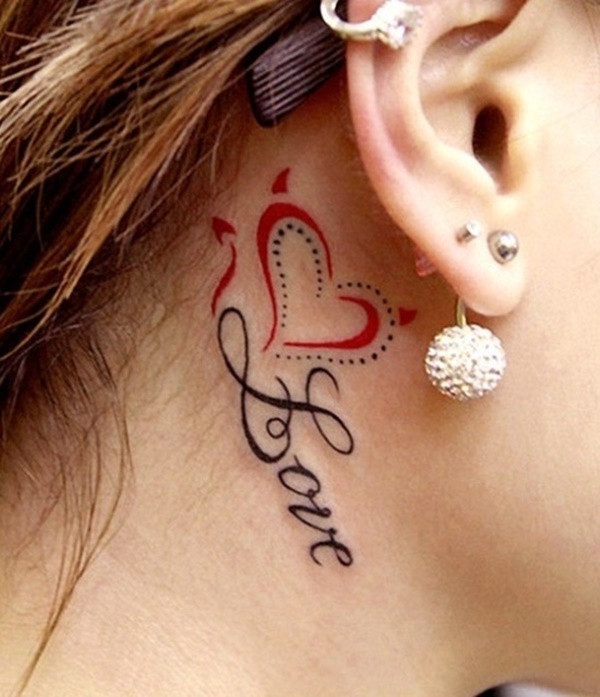 “Love,” is spelled in an intensely black script font in this tattoo. 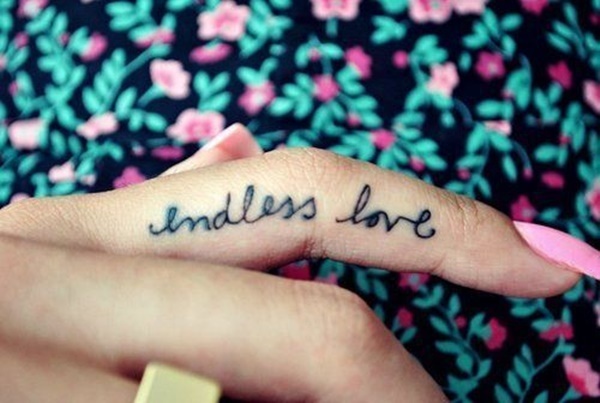 “endless love,” is spelled in a sloppy cursive font on the wearer’s index finger in this shaky tattoo. 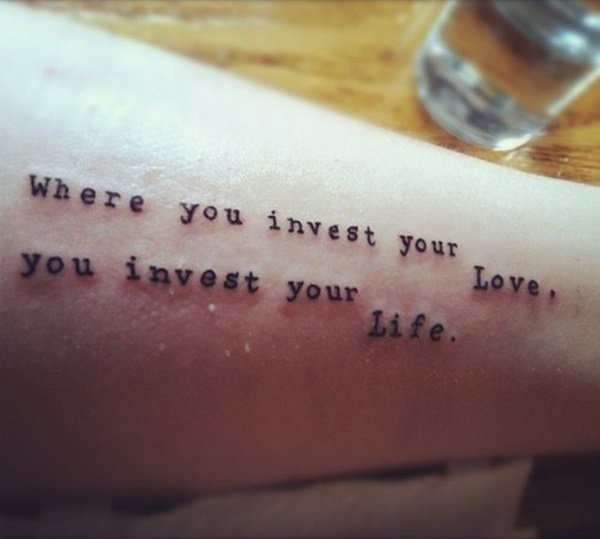 “Where you invest your Love, you invest your Life.” Is spelled out on the wearer’s forearm in a basic font. 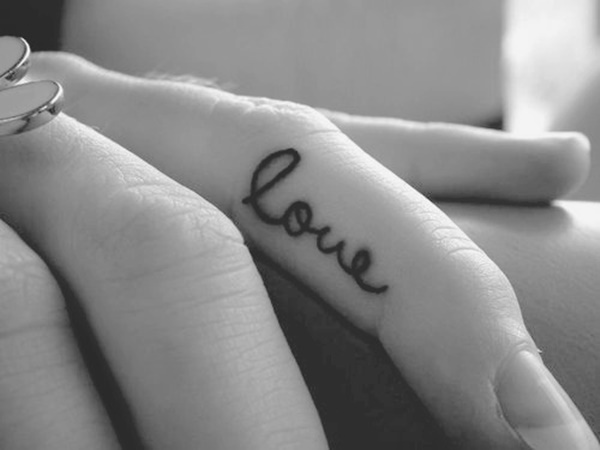 “Love,” is written on the wearer’s ring finger in black, cursive font in this typical tattoo. 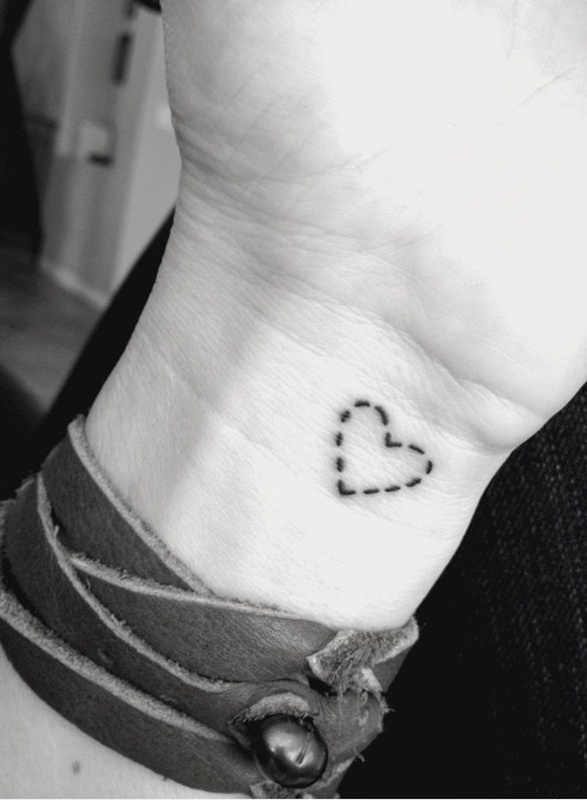 I have never been good at math, which is one of the many reasons I became a writer, but this tattoo seems to a mathematical equation that spells out the word love. I would critique the tattoo further, but I have no idea what I’m looking at. 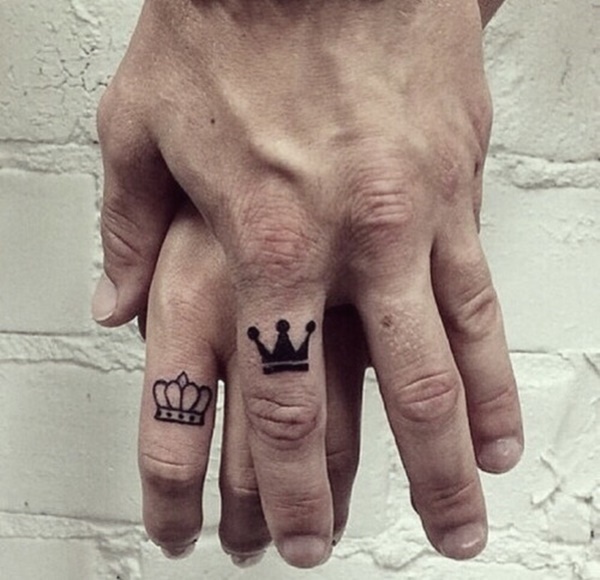 I can’t think of a more simple expression of affection than these tattoos. 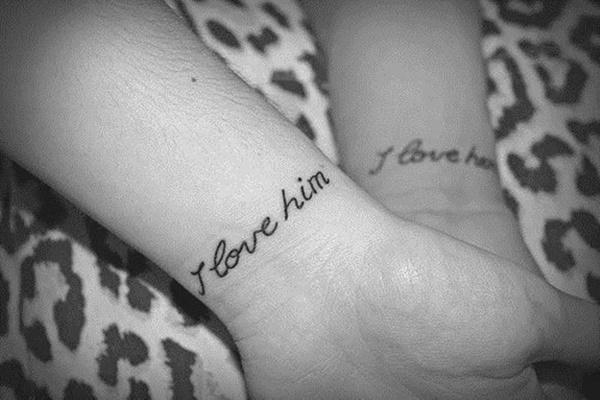 “I love him,” is tattooed on the female wearer’s wrist while, “I love her,” is tattooed on the male wearer’s wrist. Silhouettes of birds are pictured connected by a pink and blue line from left to right respectively. I assume the line connecting the two silhouettes is a representation of the bird’s flight paths, which means these birds are either suffering from a frightful disease that directly impacts their equilibrium or they are hopelessly drunk. Either way, let’s hope they get home safe and stop drawing heart shapes in whimsical colors at the expense of their health. 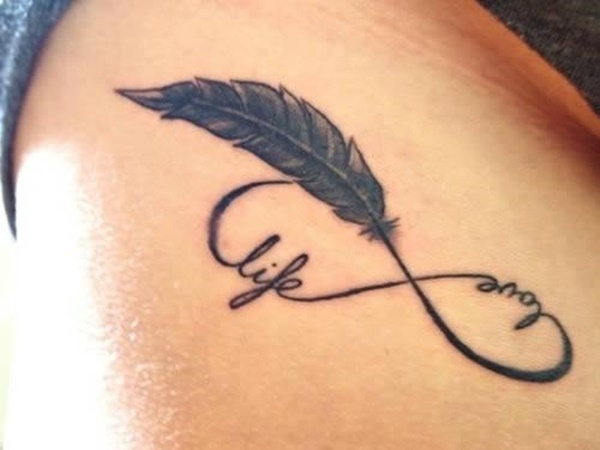 The words “Life,” and “Love,” are worked into the design of an infinity sign, which makes sense because it of course signifies life and love forever. What confuses me is the inexplicable existence of the feather in the design, I can only assume the wearer insisted upon the addition of the feather to jazz up the piece but they have only succeeded in confusing onlookers trying to decipher the meaning of their tattoo. 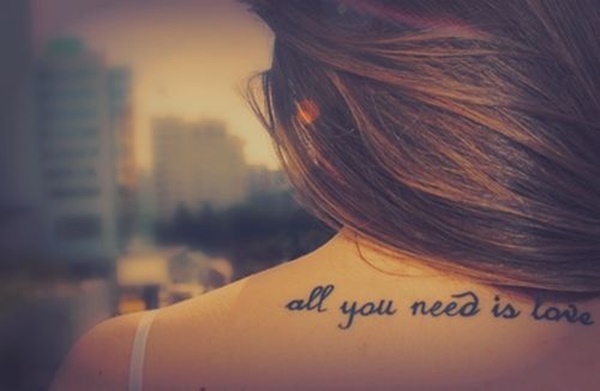 The quote, “all you need is love,” is written across the wearer’s back in a cursive font. 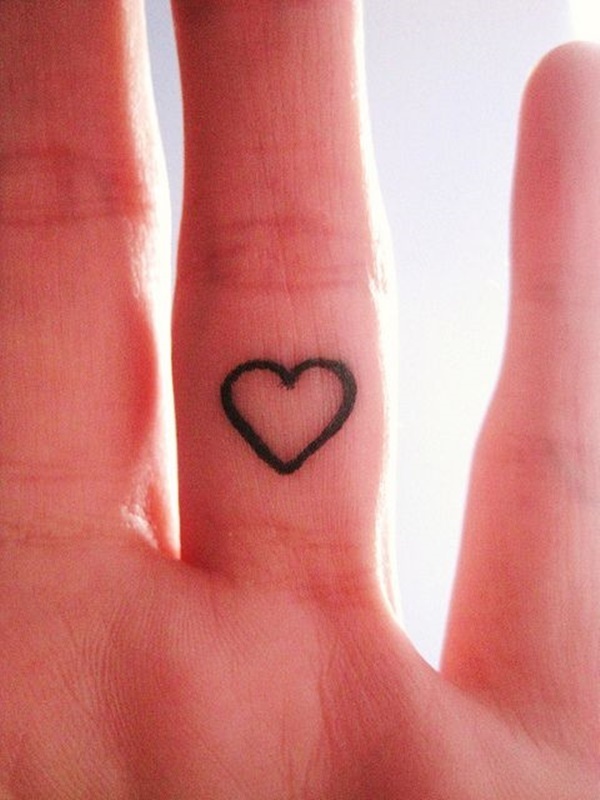 A subtle black heart outline is pictured on the wearer’s index finger. 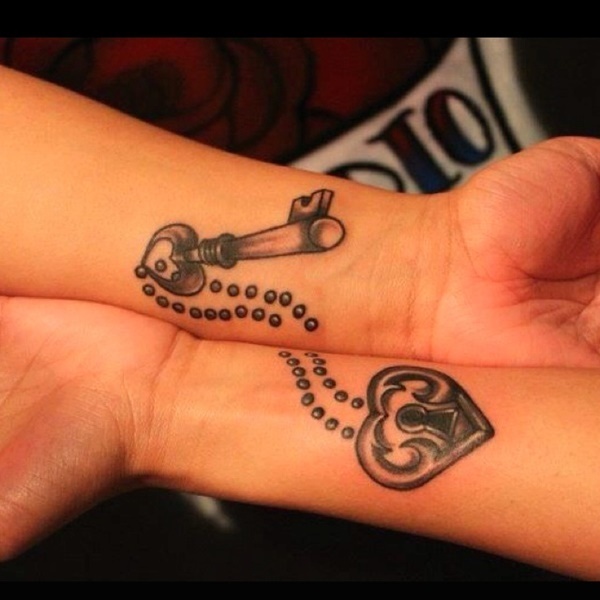 An ornate key and heart shaped lock are shown on the wearer’s wrists in this tattoo set. The aspect I find most impressive is the detail attributed to the teeth of the key, superior line work and shading adds a genuine sense of realism to the piece. 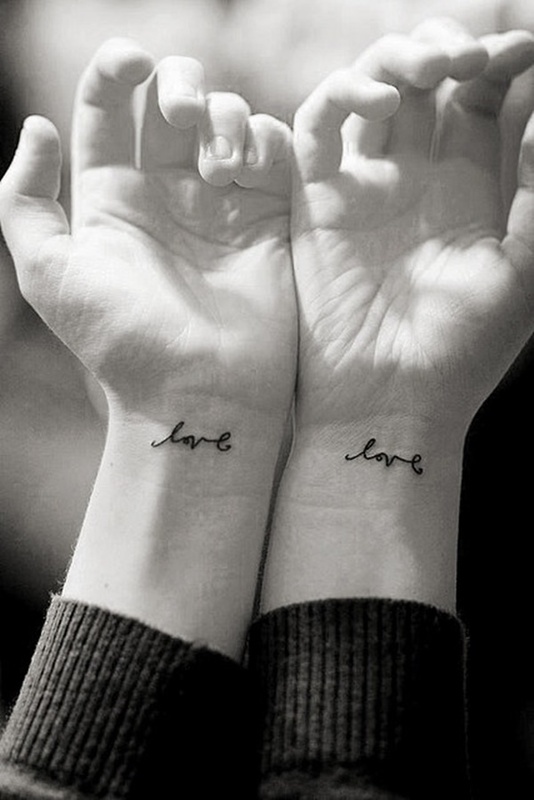 I understand the concept of this tattoo entirely, the letters are combined to spell “Love,” when the couple holds hands, however the placement of the letters spells the non-existent word LVOE to an observer. Offsetting or staggering the letters could have easily fixed the problem while it may have been better to not get the tattoo in the first place because when your significant other isn’t around you just have a random pair of letters tatted on your hand. 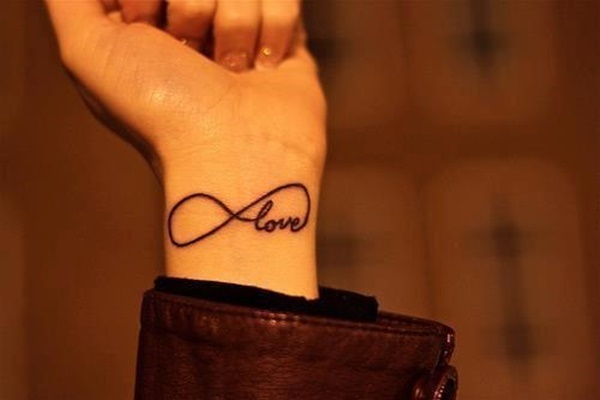 An infinity sign incorporates the word “love,” into the design in this wrist tattoo. 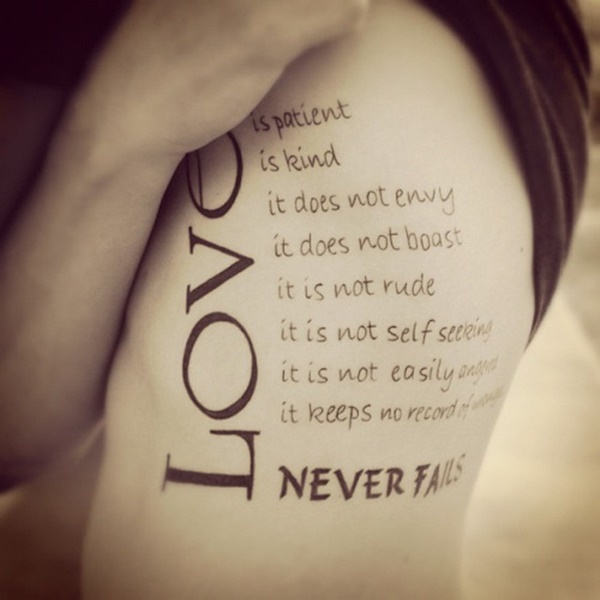 This wearer’s rib cage includes the quotes Love is patient, kind, it does not boast, it is not rude, not self seeking, easily angered, it keeps no record anything, love never fails. 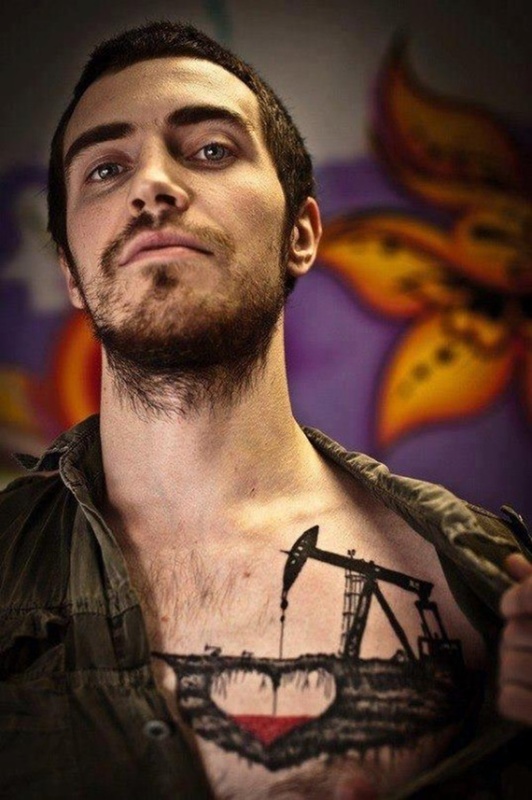 This inventive piece depicts an oil derrick pulling a red fluid from the wearer’s heart on his chest. Black and gray is used to portray the derrick and surrounding earth while the liquid being harvested is red. 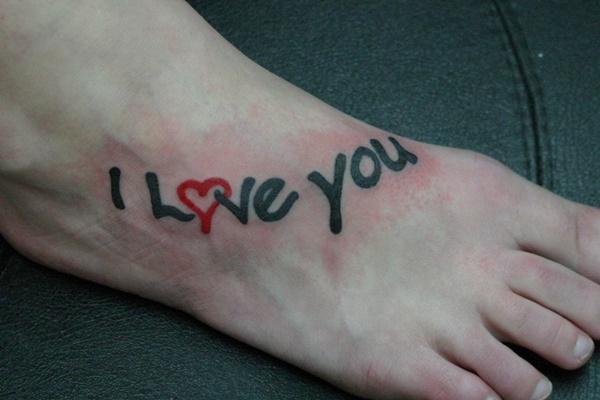 A pair of overlapping black and gray arrow pierced hearts are wrapped with banners reading, “Love,” and, “Hate,” in this tattoo pictured on the top of the wearer’s right foot. 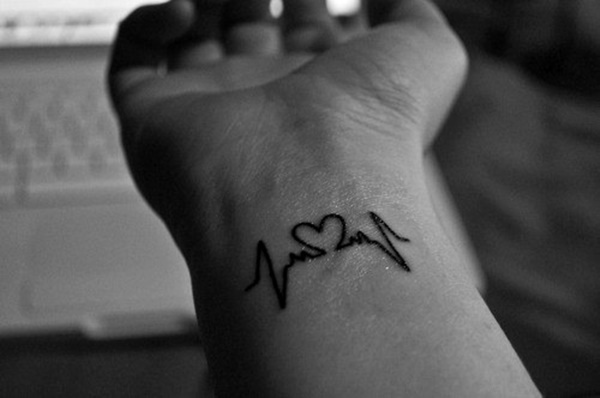 The heartbeat monitor from an EKG machine is pictured on the wearer’s wrist with the outline of a heart shown in the middle. Script font spells out a L and leads into a series of scrolls that look vaguely similar to heart shape and the word love. 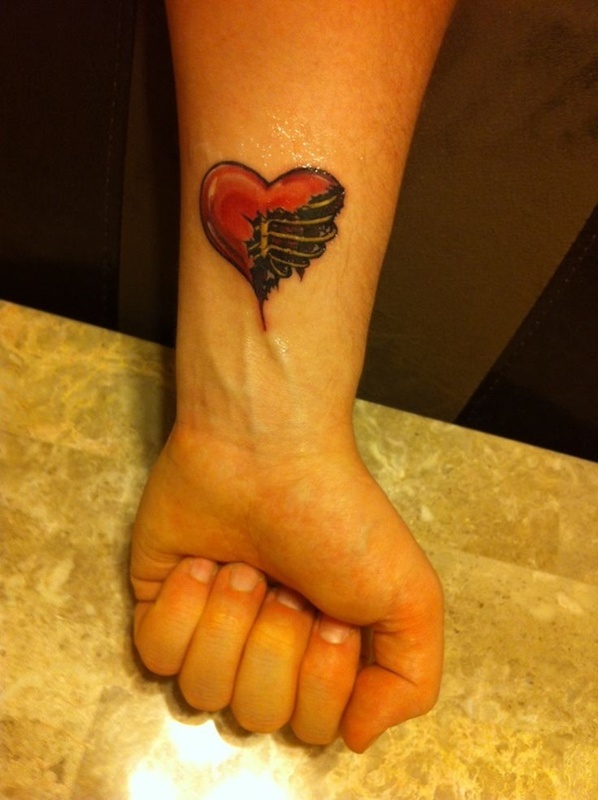 This tattoo imitates the famous LOVE statue displayed in Love park in Philadelphia. Robert Indiana installed the statue in 1976 and the sculpture has become a landmark for Philadelphia over the ensuing decades. 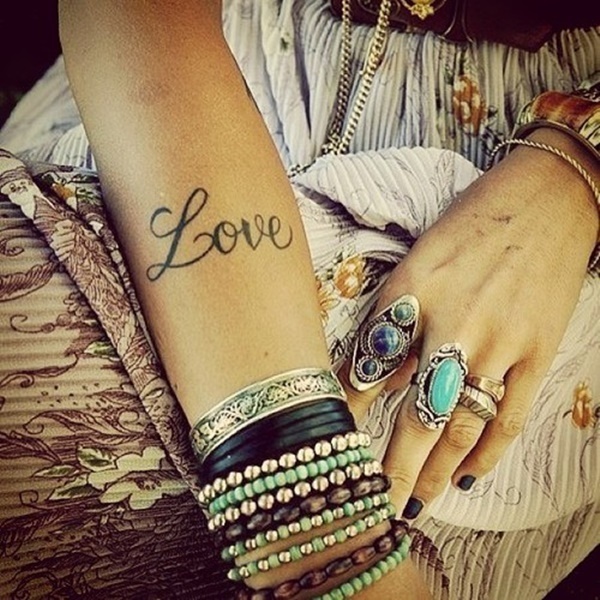 “Love,” is written in an elaborate cursive font on the wearer’s forearm in this tattoo. 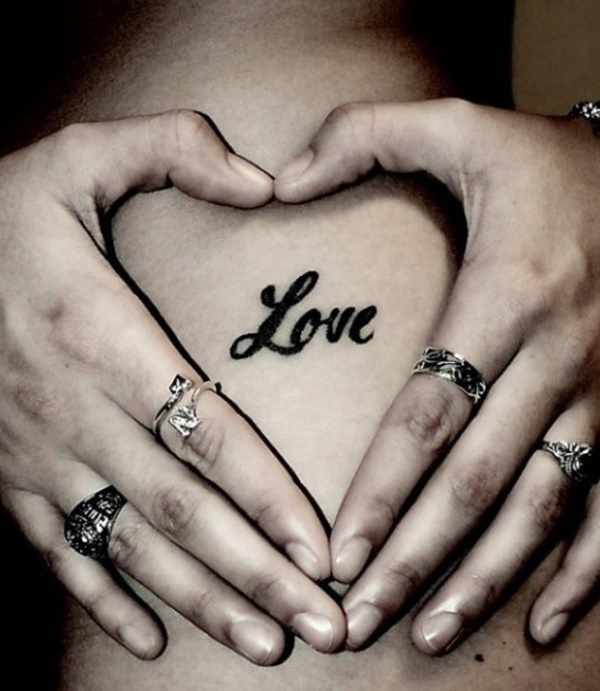 The words hope, dream, love, light, and unity are scrawled into a heart shape in this tattoo depicted in black ink. 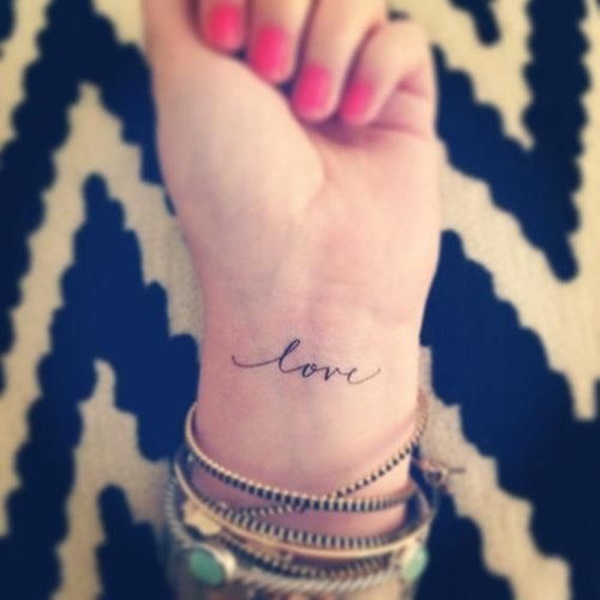 “Love,” is scrawled across the wearer’s wrists in a cursive font in this almost matching pair of tattoos. 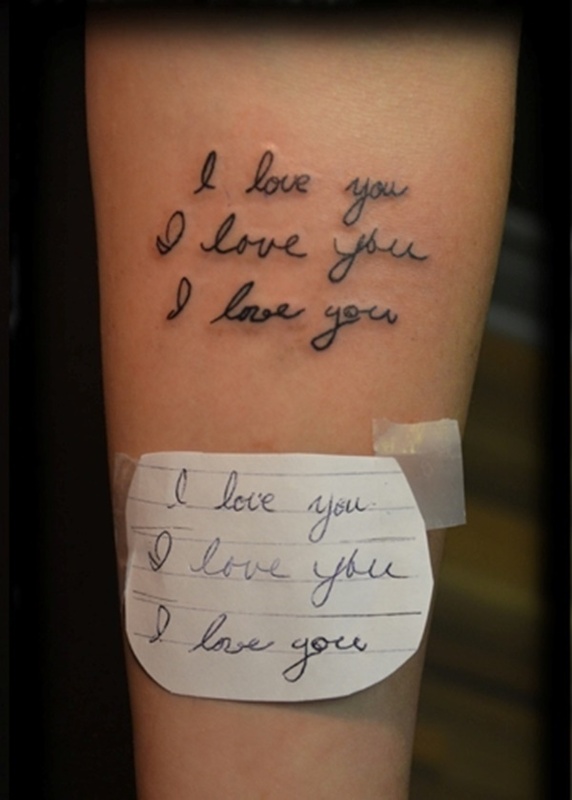 Based on the actual handwriting of the wearer’s loved ones, this tattoo scrawls the phrase, “I love you,” across the wearer’s forearms in black ink and replicates the handwriting shown on paper. 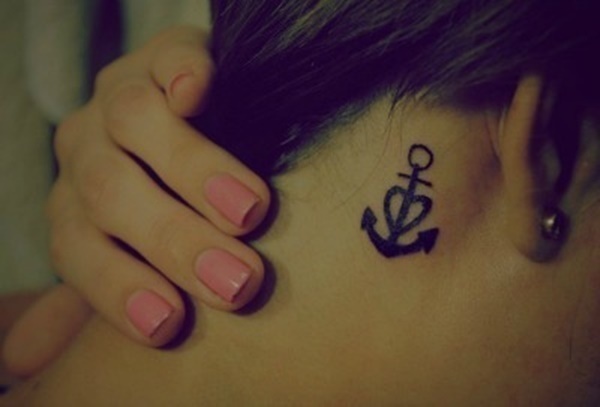 An anchor with a heart along the shank is pictured behind the wearer’s ear in this black tattoo. 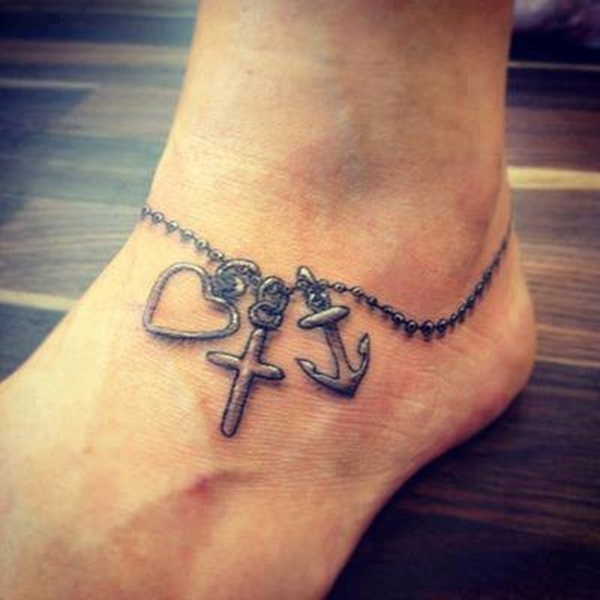 An anklet is composed using black, gray, and white ink and holds a heart pendant, cross pendant, and anchor pendant. 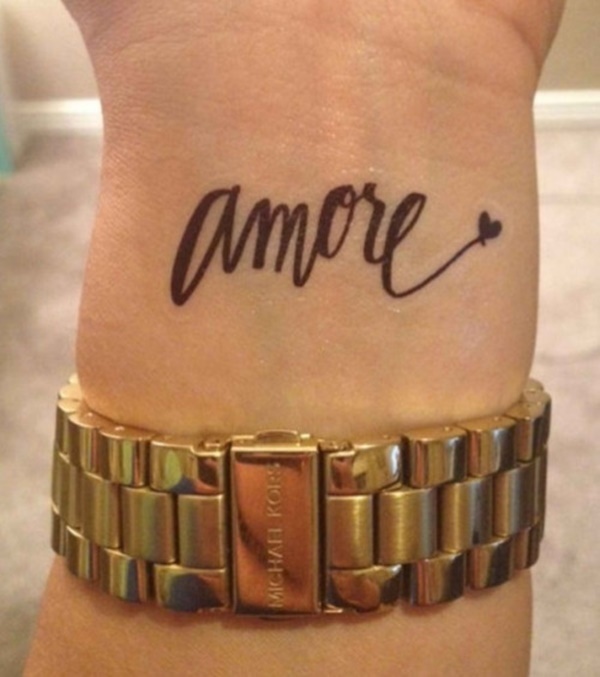 Amore, the singular form of my love in Italian, is written across the wearer’s wrist in a very precise font and embellished with a heart at the end of the word. 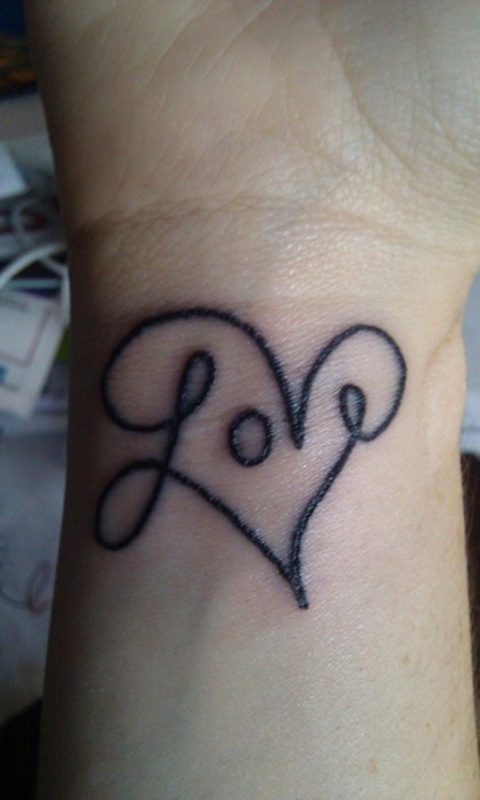 “Love,” is written in a delicate cursive font on the wearer’s wrist in this tattoo. 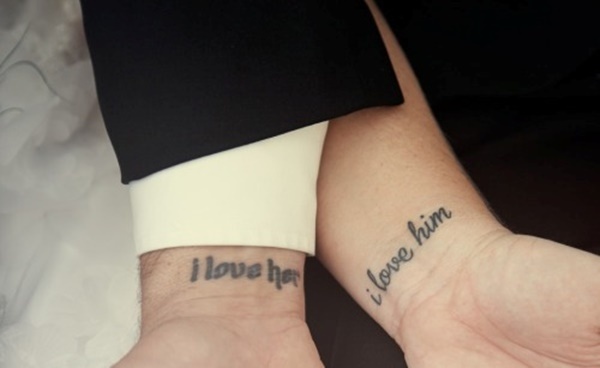 Another example of tattoos reading “I love her,” and “I love him,” written across the wearer’s wrists is seen in this photo. 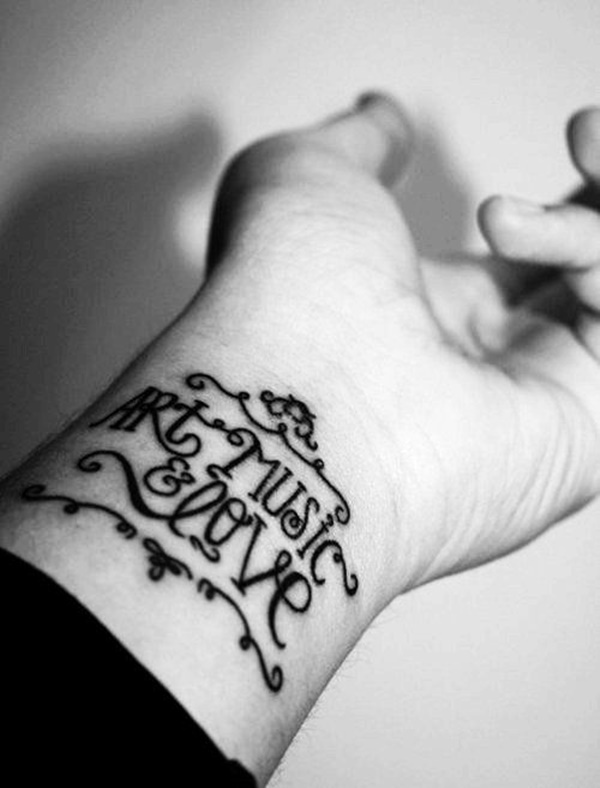 Art, Music, and Love are written across the wearer’s wrist in an elaborate font and embellished with scrolls in this black wrist tattoo. 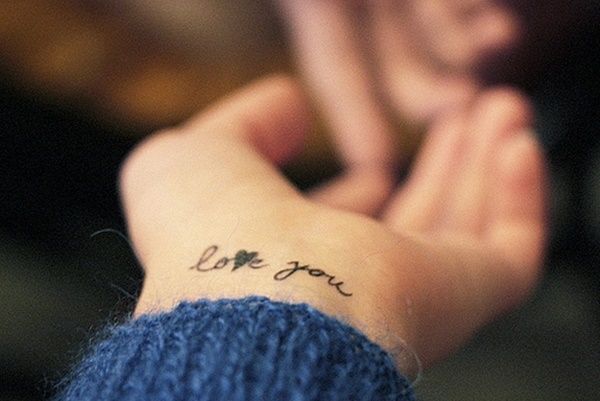 “Love you,” is written across the wearer’s wrist in black ink and the V is replaced with a blacked out heart. 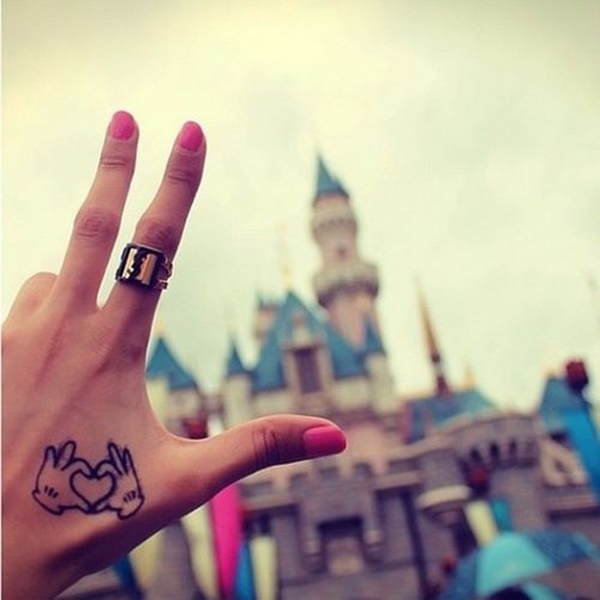 The immediately recognizable image of Mickey Mouse’s hands are shown forming the shape of a heart with their fingers in this tattoo that adorns the wearer’s left hand near the thumb joint. 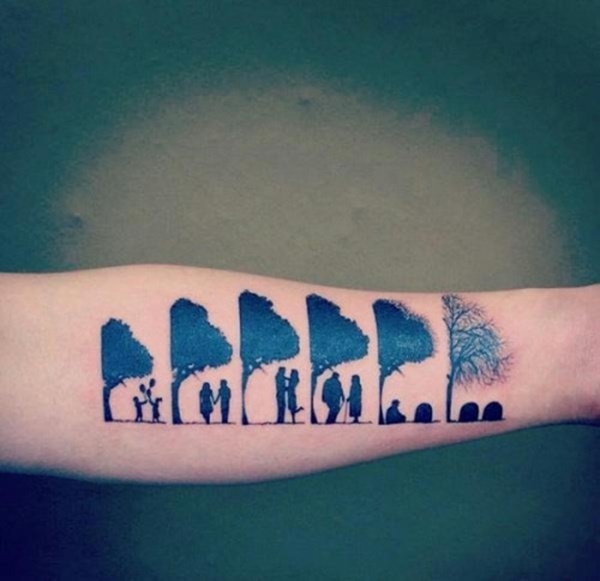 Anyone can replicate an image or tattoo they’ve seen before, but a tattoo like this shows a unique sense of creativity and emotional depth. A tree frames every image and the first picture portrays a boy and girl playing with balloons, while the second image shows the couple holding hands, the third shows the couple embraced, the fourth shows the couple as elders, the fifth shows the man sitting next to the headstone of his dead lover, and the fifth shows the tombstones of the man and woman sitting next to each other under the now dead tree. This is a truly incredible concept devoid of cliche. 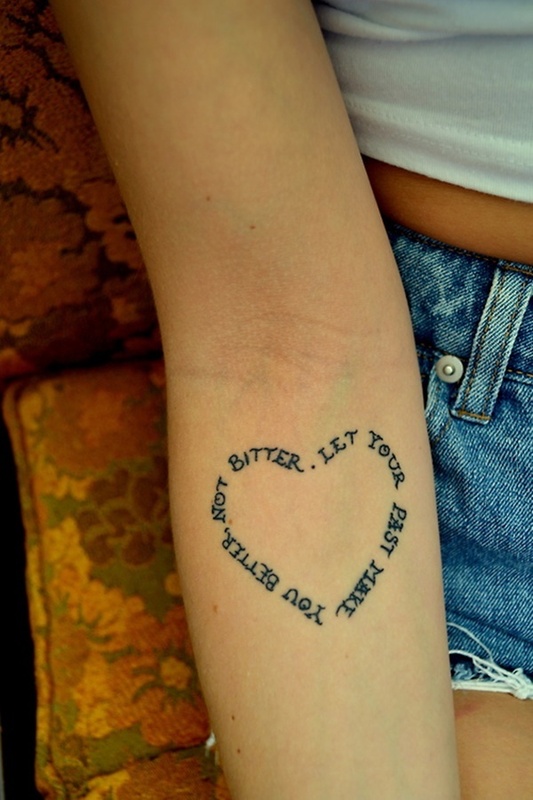 The quote, “Let the past make you better, not bitter,” is written into the shape of a heart in this black tattoo. 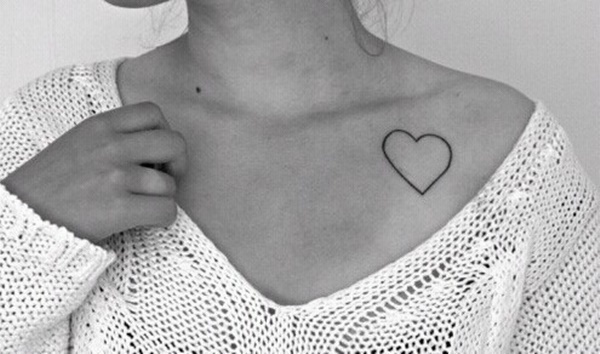 A simple, but slightly lopsided, heart outline is inked onto the left side of the wearer’s chest underneath the collarbone in this tattoo. 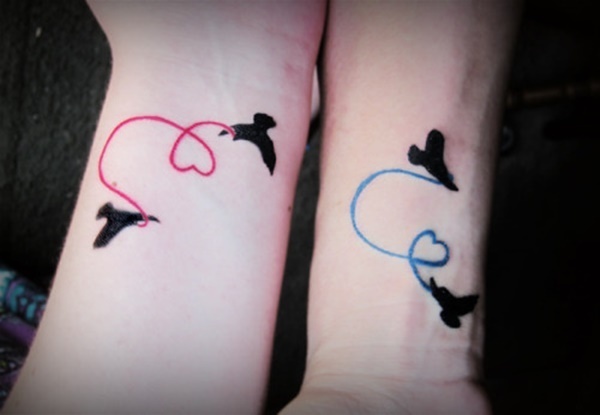 Matching heart outlines are inked onto the wearers’ wrists underneath the their wrist bones in this matching tattoo set. 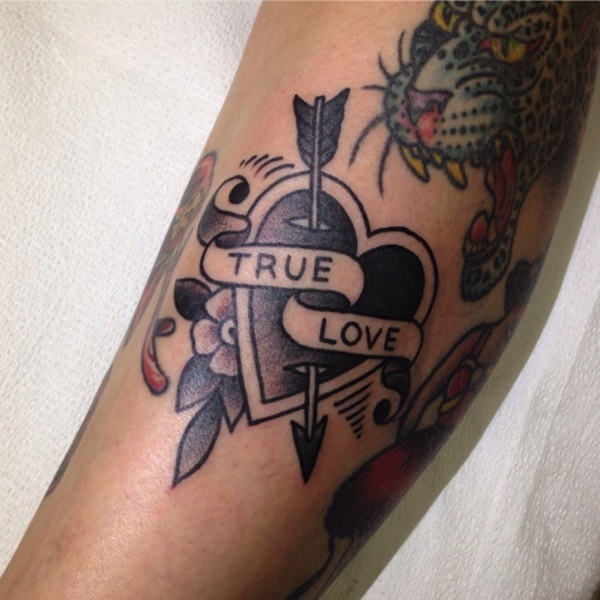 A black and gray heart is pierced with an arrow, adored with a banner reading, “True Love,” and embellished with flowers and a colorless border. 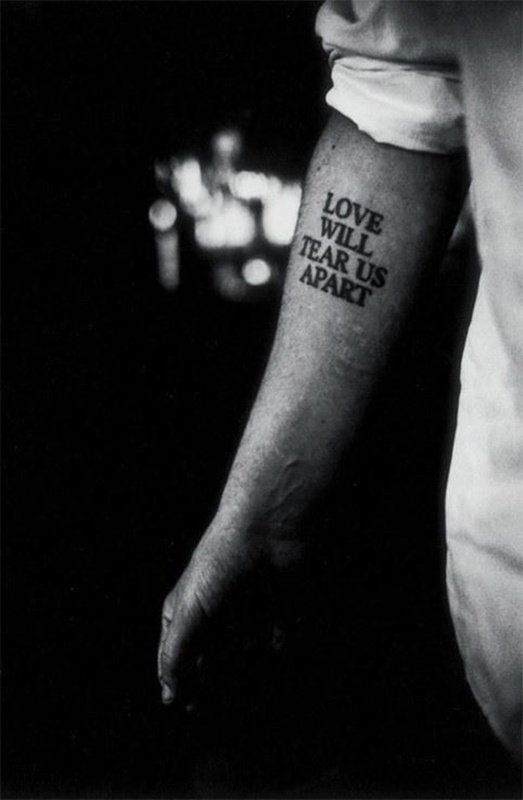 A bold black font spells out the quote, “Love will tear us apart,” on the wearer’s forearm beneath the elbow. A set of complimentary, yet distinctly different, crowns adorns the wearers’ ring fingers in this tattoo set depicting the wearers as king and queen. 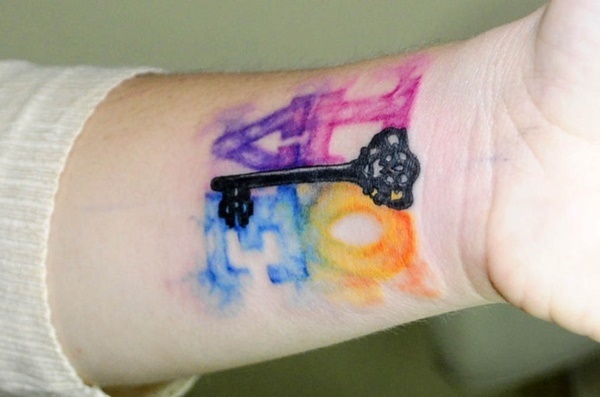 A style imitating watercolors uses vivid colors to spell out the word, “Love,” with a black and gray skeleton key placed in the middle. 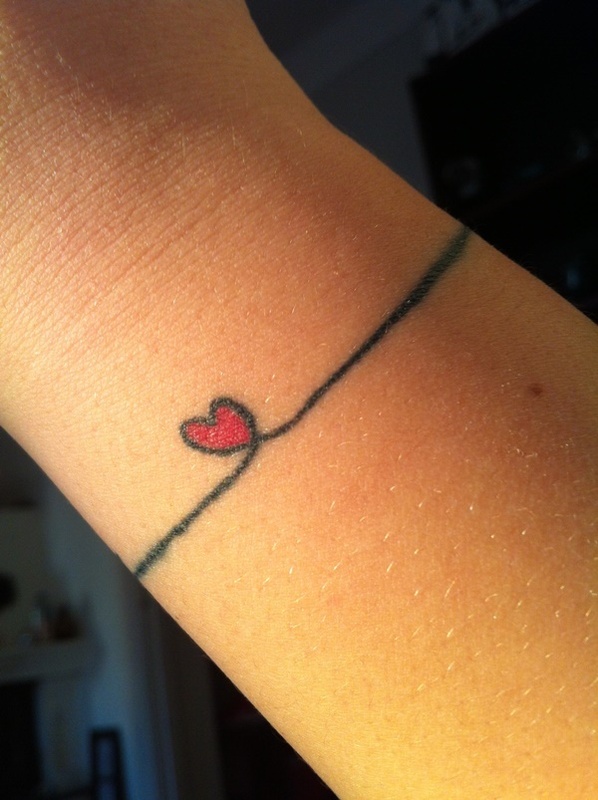 A shaky line leads into a red heart in this wrist tattoo. 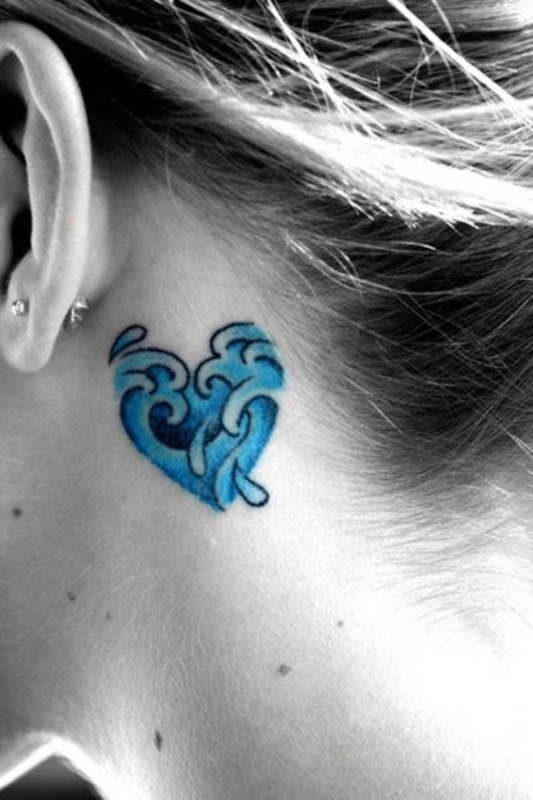 A heart is composed using the traditional depiction of waves with blue and black ink. 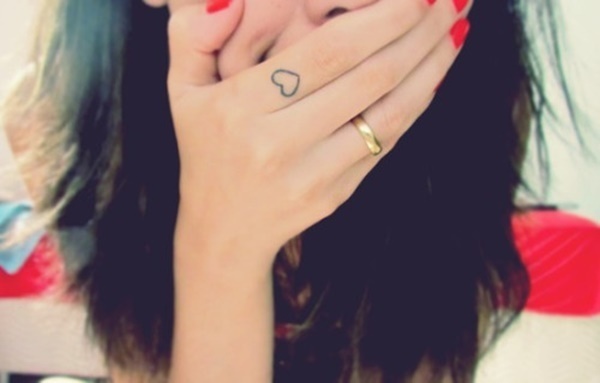 A bold, black outline is used to compose a heart outline on the wearer’s ring finger. 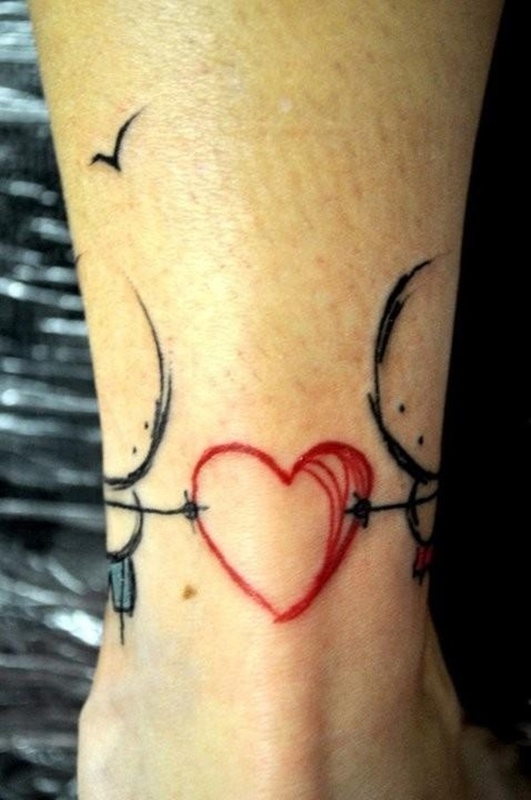 Red hearts outlined in black ink are shown on the wearer’s wrists and feet in this tattoo set.